ShowingTime has many options available in regards to communication methods. We provide agents with the following methods to be informed of Showings or informed of Confirmed or Cancelled appointments. Call notifications will appear on the scheduling screens when required in the scheduling process. if a call is placed but the contact was not reached, the system will prompt you to choose a time to try calling again later. Email notifications require a valid email address to be set up - for the agent in their profile or through their MLS, and for owner/occupants through the Contact Details section. Emails will be sent out automatically during the scheduling process. Also known as known as SMS (Short Messaging Service), text notifications will also be sent automatically during the scheduling process. All ShowingTime customers will have two-way SMS. Notifications of appointments & status are sent instantaneously, in which these messages can be replied to with either a 'Y' to confirm a showing, or 'N' to decline a showing. Push Notifications are a style of Internet-based communication. Push notifications allow ShowingTime to send requests, status' of appointments, as well as any other message pertaining to a showing or feedback, directly to your phone to keep you informed. When your listing is set for an accompanied showing, it will look a little bit different. You will still be able to choose how you wish to be notified. You will also see the Initial and Final confirmation indicators. These buttons are used for moving contacts to adjust the call order when the Appointment Center calls for confirmation. Used to deleted contacts from a listing or an exception. Contacts can only be removed from the listing if they are not associated with an exception. Used to move contacts between units for listings configured as multi-unit. Call notifications will be prompted in the order that the contacts' phone numbers are listed on this form. Text Messaging options will only show when a contact has a phone number and the phone type has been changed to "Mobile Phone"
Mobile App access can only be provided to sellers or tenants if we have a valid email address on file due to the authentication process involved. Once they have used the authentication links provided in the email, their devices will show up under the Devices section. Sellers & tenants are not restricted to the number of devices they can have authenticated at one time. It should be known that if there are multiple contacts for a listing, it's better that each contact is listed independently so proper logging is associated with that contact with any action they take to confirm, cancel, or decline appointments. 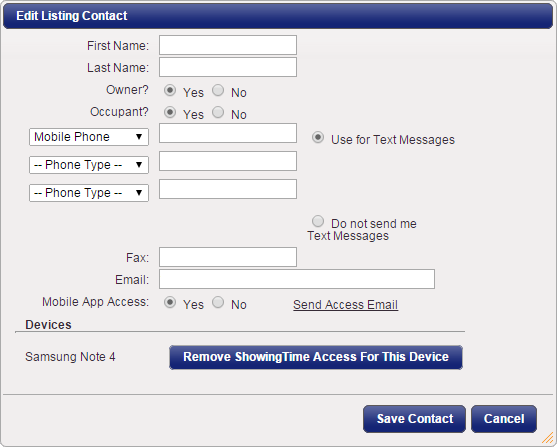 In order to revoke access to a specific device, click on the Remove ShowingTime Access For This Device button.